Securely wrap your baby during each diaper change. 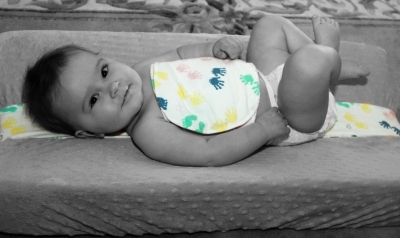 Prevents your baby from rolling and escaping your grip while on any changing surface. The Wiggle Worm Wrap is an extra set of hands when changing your baby's diaper. I have twins and I wish I had this sooner. This is a great product for babies that love to move around. Beautifully made. Super cute! For a wiggles baby, this could be awesome! soft fabric is nice.